Welcome to my World of vegetarian cooking where dishes are made simple innovative & delicious for our home standards & can be made at home. Well more to say about my site it is like guides for vegetarian cooking where in people nowadays turn to vegetarian due to various reasons but the most common thing is that it is quiet natural & good for health. In other words would like to put up vegetarian cooking in this way. This is a basic recipee most of indian favourite sweets in India. Basically from the place called Mysore in Karnataka. Preheat the pan, add gram flour to fry in dry heat & keep it aside. Add sugar in a deep bottoam kadai, make a sugar syrap upto one thread sticks consistancy. Add gram flour mix well & add leftover ghee. Mix well & empty it in a greased pan & allow it to set. Allow it to cool & portion it into equal squares & serve. Congragulations with your century post. This is one of my favourite sweet, i love them. congratulations - 100 posts! how cool. the mysore pak looks so professional - well done. Nice sweet dish to clelbrate your 100th post, Congratulations. Oh my gosh Mysore Pak!!! !....you must be a great chef, I believe its one of the hardest recipe to fix at home, right! Your version looks yummy! Congrats on ur 100th post!!! Having associated "mysore" to "pak", never occured to me that it was actually from the city of Mysore! 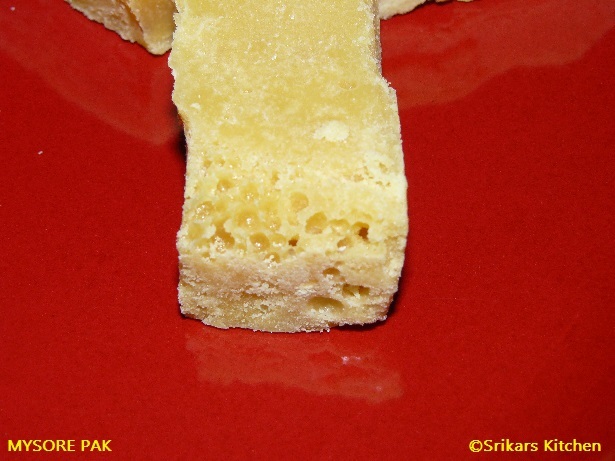 wow Srikar's mouthwatering mysore pak. this is in my to do list..yours have come out good..congrats on your 100th post..
Suprise Weekend Bonanza waiting for you. Congratulations! and what a perfect sweet to celebrate it. 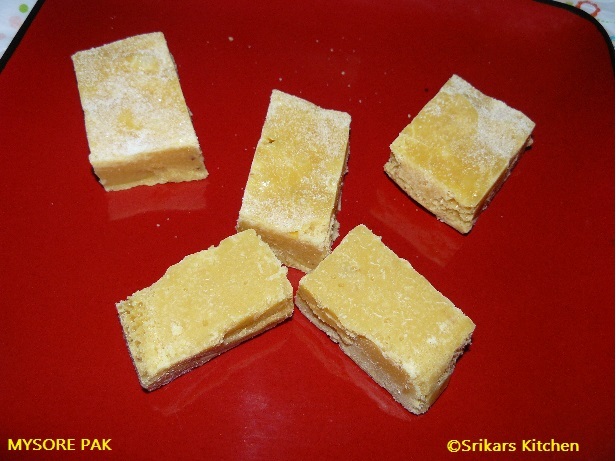 Mysore Pak brings back lots of memories. Yours looks delicious. A lovely surprise is waiting for you collect it from my blog!!! Congrats on your 100th post and a very delicious sweet treat you have here to commemorate your 100th recipe! Thanks for letting us know about the thieves that stole your creations, it is good to know!!! Congrats on ur 100th post! Mysore pak looks so professional! Food blog by Sripriya Vidhyashankar is licensed under a Creative Commons Attribution 2.0 UK: England & Wales License. Based on a work at srikarskitchen.blogspot.com.